A. All VITRITURF materials must be stored indoors, in cool dry storage. 1. Primer and Binder: must be protected from moisture and heat. Store at 40 F to 80 F and out of direct sunlight. 2. 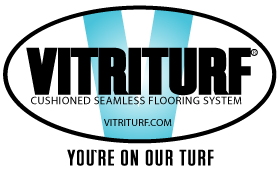 VITRITURF Granules: must be protected from moisture – store out of sunlight. B. Handling of VITRITURF Components: All components are factory labeled by batch number. Check batch number prior to use. NOTE: Binder and Primer have a shelf life of six (6) months. Check all granules of similar colors to ensure they are exactly the same prior to use. Read material safety data sheets carefully prior to opening containers. Wear protective clothing and eye gear. A. Binder with SBR shredded granules for Base Mat. 1. Binder is mixed with the SBR shredded granules at the ratio of 82/18 by weight. This equates to approximately one (1) gallon of Binder to one (1) bag of SBR shredded granules. 2. Depending on the size of the project, you may mix the Binder/SBR mix either in a trough with a hoe or a mechanical drum mixer. Be sure the SBR shredded granules are thoroughly coated. 1. Binder is mixed with the EPDM Granules at the ratio of 82/18 by weight. This equates to approximately 1.25 gallons of Binder to 1 (one) bag of EPDM Granules. 2. Depending on the size of the project, you may mix the granule mix either in a trough with a hoe or a mechanical drum mixer. Be sure that the granules are thoroughly coated. 1. Apply Primer by spray or short nap roller at the rate of 300 square feet per gallon. Do not over saturate substrate. Allow to tack out (approximately 20 minutes) prior to application of VITRITURF SBR shredded granules (Base Mat). NOTE: Do not use Primer over compacted stone. 1. Apply mixed Binder/SBR at desired thickness using a screed bar. 2. Using a steel pool trowel even Binder/SBR mixture. Be sure to continuously lubricate trowel with kerosene, diesel fuel or soapy water. Do not saturate surface with these lubricants. 3. As the mixture is leveled apply a downward pressure onto the surface so that the mixture compacts tightly. 4. Check surface to be level. 5. With a water bottle apply a spray mist of clean cool water to the surface and float the trowel over the lubricated surface. 6. Allow to dry for a minimum of 24 hours. Once the Base Mat has dried apply Primer by spray or short nap roller at the rate of 300 square feet per gallon. Do not over saturate Base Mat. Allow to tack out (approximately 20 minutes) prior to application of VITRITURF Wearing Course. 1. Apply mixed Binder/Granule at desired thickness using a screed bar. 2. Using a steel pool trowel even Rubber/Granule mixture. Be sure to continuously lubricate trowel with kerosene, diesel fuel or soapy water. Do not saturate surface with these lubricants. 6. Allow to dry for a minimum of 48 hours prior to usage. 1. Clean all tools and surface spotting immediately with Thinner C or diesel fuel prior to drying. Note: Once Binder has dried it will be extremely difficult to remove from toots or surfaces or hands. A. Wear protective clothing and eye gear. B. All substrates must have a minimum of 1% slope to provide positive drainage. C. Ambient air temperature should be 40 F (4 C) at the time of installation of the VITRITURF System.The System may be installed with temperatures below 40. The temperature only affects the system in workability of the materials and the dry time. The lower the temperature, the thicker the viscosity of the binder and the dry time may become delayed without any detrimental affects to the system. D. Protect from rain for a minimum of 48 hours after application. E. Read all MSDS sheets very carefully. If you do not understand them, contact the manufacturer immediately prior to application. F. If Binder accidentally comes in contact with eyes immediately rinse with water and contact a physician.